I love be surprised when I go to the theatre. 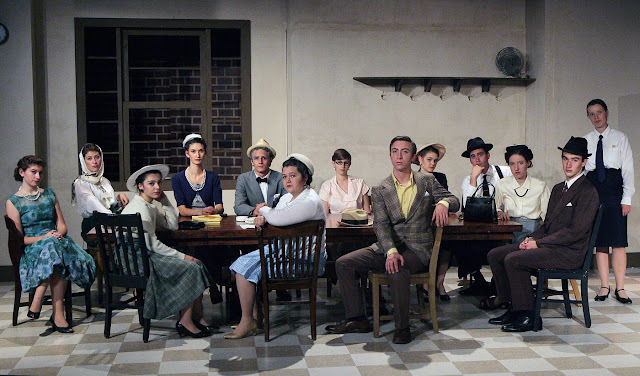 I had never seen Twelve Angry Men, the play, and I saw that Gunn High School was performing it. One of my own kids goes to Gunn, so I decided to go with him. These young people were wonderful. Yes, the boys forgot to blend their make-up, yes it could have been titled Eight Angry Women and Four Angry Men, and yes it seemed silly when an angry man threatened to punch an angry woman, but whatever the production lacked in professional polish, it more than made up for in guts, raw and authentic passion, and unbridled commitment to the story. I enjoyed this production more than anything I have seen in any professional theatre since my trip to London over a year ago. Everyone in this show was completely committed to his or her role, creating a thought provoking and riveting play. Let me point out the performance of one actor in particular. I hesitate to do this because I don't meant to take away from anyone else in the show - they were all very good - but Blake Vesey as Juror #3 embarked on one of the most courageous performances of anything I have seen on stage in a long time. As one becomes more and more trained as an actor, many teachers and directors (especially in the U.S.) will encourage an emotional actor to pull back, not become "too angry". They say things like " you will lose your audience", "people won't care about you anymore", and a myriad of other things to prevent the actor "over acting". Fortunately for us, people like Al Pacino, Robert DeNiro, and Cherry Jones, never heeded that advice. Today, I saw Blake Vesey do the same thing that those courageous celebrity actors have become famous for. Blake never backed off. We find out at the end of the play why he is so enraged and it's for good reason. For two and a half hours his entire performance was fueled by that rage. Even when he was speaking quietly, it was there under the surface ready to explode. By the end of the play when he seemed at his limit, he stepped it up a a notch and the audience was riveted. The emotional commitment and courage that this young man seemed to grasp and fully inhabit went beyond anything I have seen any adult do on stage in my recent memory. If he pursues an acting career, lets just hope that this unbridled passion doesn't get buried under the techniques he learns in drama school. As I said, I could say numerous wonderful things about each and every person in the cast and if I had the time I would. Thank you all for a wonderful afternoon of theatre.